Media Release -- Devil's Due Digital, Inc. announced today the launch of over 50 series-based apps in the Apple iOS storefront. This number of apps gives Devil's Due Digital the largest selection of standalone comic apps in the App Store--representing roughly 1,000 downloadable comics in total. Media Release -- Fans and friends, select Checker Books graphic novels are priced for our Paypal customers at $4 per edition. Look below for a complete listing or visit http://www.checkerbpg.com/ . 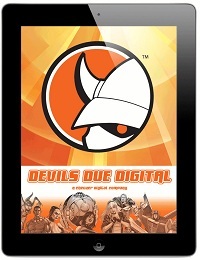 Media Release -- You are now able to buy full length Devil's Due Digital graphic novels through the Amazon.com Kindle store. Devil's Due Digital offers hundreds of single issue comic books digitally on a variety of platforms, including comiXology, iVerse, the Apple App Store, Graphic.ly, Longbox, and now Amazon. Media Release -- Growing Gold: A Continued Celebration by Johnny Hart has been announced as the first title under Checker's new worldwide distribution agreements. Sigil: Death Match V. 5 (containing the never-before-published issues 27-32)/198 pgs. & $17.95 from Checker Books/words: Chuck Dixon; principal art: Scot Eaton/sold at book stores, comics shops & www.checkerbpg.com. What is the value of seeing only the last ten minutes of a movie or reading the last five pages of a book? Well, one might learn that the movie or book wasn’t worth watching or reading. Sigil: Death Match publishes the last six, unpublished issues of an epic, SF comic book series released several years ago and cancelled before those issues made it to book and comics shops. You will find no finer piece of literature in the world of comic strips or comic books than STEVE CANYON. Sadly, I started reading this strip in its waning years, as the Vietnam war was ending, and newspapers and readers starting turning away from what was a patriotic and military oriented story. However, we can recapture the magic of the strip's early years in this fine trade paperback series by Checker BPG. Scion V. 6 (reprinting CrossGen issues 34-39)/153 pgs. & $17.95 from Checker Book Publishing, principal artist, Jim Cheung; Ron Marz, writer/sold in comics shops and at www.checkerbpg.com. 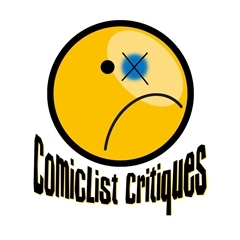 Imagine the 'knights and damsels' comic strip Prince Valiant sprinkled with pseudo light sabers and aliens and you've pictured Scion, a comic book series that ran for thirty-nine issues before its original publisher went out of business.